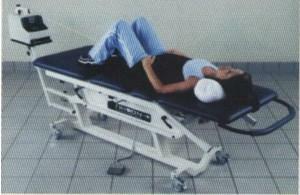 Decompression therapy (DTS) is a non-surgical treatment in the management of serius low back/leg or neck/arm pain. DTS treatment is directed at relieving pressure on structures that may be a major source of pain. It can relieve the pain associated with bulging and herniated discs, degenerative discs, facet syndrome, sciatica and headaches. DTS hels relieve pain through decompression of lumbar or cervical discs and joints (that is unloading due to distraction and positioning). This cyclical, painless stretching reduces pressure and promotes blood and fluid flow. This helps improve healing naturally. 25 years of research combining efforts of doctors and therapists has led to the development of this technology. The DTS is not only a technically advanced device-but a safe and cost-effective alternative to invasive treatment.